The park stretches along a hillside and is on two levels. 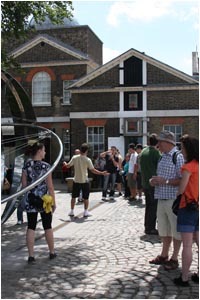 The lower level (closest to the Museum, Queen's House and, beyond them, the Thames) lies to the north; after a steep walk uphill, there is a flat expanse that is, essentially, an enclosed extension of the plateau of Blackheath. Roughly in the centre, on the top is the hill, is the Royal Observatory, Greenwich. To the north is the National Maritime Museum and Queen's House, and beyond those Greenwich Hospital. To the east is Vanbrugh Castle. To the south is Blackheath and in the south western corner is the Ranger's House, looking out over heath. To the west lie the architecturally fine streets of Chesterfield Walk and Croom’s Hill (Pevsner 1983). The Observatory is on the top of the hill. 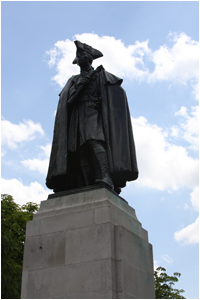 Outside is a statue of General James Wolfe in a small plaza from which there are majestic views across to the former Greenwich Hospital (later the Royal Naval College and now the University of Greenwich) and then towards the river, the skyscrapers of Canary Wharf, the City of London to the northwest and the Millennium Dome to the north. 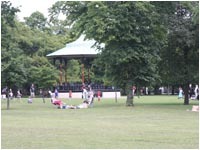 On the upper level, there is an extensive flower garden complete with large duck pond, a rose garden, a cricket pitch, many C17th chestnut trees with gnarled, swirling trunks, tennis courts, a bandstand, Roman remains, an ancient oak tree (the 'Queens Oak', associated with Queen Elizabeth I) and an enclosure ('The Wilderness') housing some wild deer. Nestling just behind the Observatory is the garden of the former Astronomer Royal, a peaceful secluded space which is good for picnics and also sometimes used by theatre groups (Midsummer Night's Dream, etc). On the opposite side (i.e., just south of the Wolfe statue) is the Park Cafe. There is another, smaller, cafe by the north west gate. It is possible to park (pay and display) in areas along the main roads entering from Blackheath. Cycle routes criss-cross the park (as do runners, roller-bladers, dog-walkers, etc), but other road traffic (cars and motor-cycles only) can only use the park road linking Blackheath and Greenwich at peak periods on weekdays. When London hosts the Summer Olympics in 2012 Greenwich Park will be the venue for the equestrian events and for the showjumping and cross country disciplines of the modern pentathlon. The park also staged the start of the final stage of the 2006 Tour of Britain cycle race (3 September). 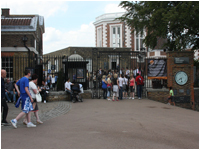 The Park hosts the Greenwich Meridian 10k in March every year..
British Military Fitness runs classes in the park when daylight permits. The International Date Line is an imaginary line which runs from the North Pole to the South Pole and is 180° away from the Greenwich Meridian. General James Wolfe (2 January 1727 – 13 September 1759) was a British Army officer, known for his training reforms but remembered chiefly for his victory over the French in Canada and establishing British rule there. Because of this he has been regarded as a hero by many Canadians.